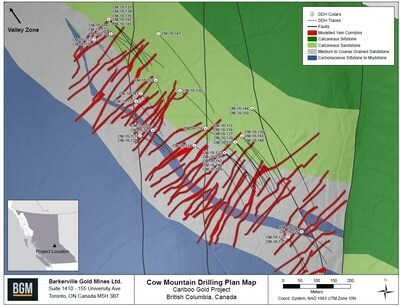 TORONTO, Dec. 6, 2018 /CNW/ - Barkerville Gold Mines Ltd. (TSXV: BGM) (the "Company" or "Barkerville") is pleased to announce drilling results from 2018 Cow Mountain exploration and category conversion program at the Company's flagship Cariboo Gold Project. The drilling results demonstrate continuity of high grade gold mineralization within vein corridors and extensions down dip and down plunge. A total of 63,970 meters were drilled on Cow Mountain during the 2018 drill program. 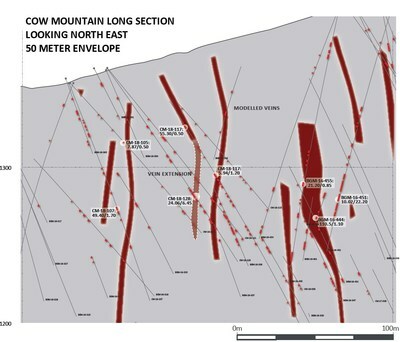 Recent highlights from the Cow Mountain exploration and delineation program include 10.50 g/t Au over 7.80 meters in hole CM-18-124, located approximately 50 meters down dip of CM-18-034, that intersected 9.33 g/t Au over 2.70 meters. CM-18-124 included a higher-grade intercept of 75.60 g/t Au over 0.80 meters. 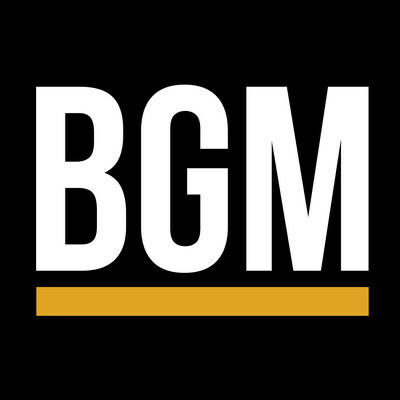 Drill holes CM-18-128 assayed 24.06 g/t Au over 6.45 meters and CM-18-129 assayed 20.23 g/t Au over 6.20 meters including a higher-grade intercept of 76.80 g/t Au over 1.00 meter. 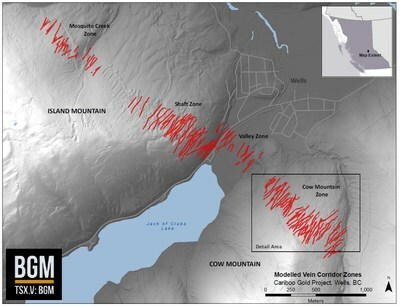 The ongoing drill program at Cow Mountain is designed to infill and expand high-grade gold-mineralized vein corridors modelled in the May 2018Cow Mountain resource estimate. Vein corridors are defined as a high-density network of mineralized quartz veins within the sandstones. Mineralized quartz veins on the Cariboo Gold Project are overall sub-vertical dip and northeast strike. These corridors have been defined from surface to a vertical depth of up to 300 meters and remain open for expansion at depth and down plunge. Gold grades are intimately associated with vein-hosted pyrite as well as pyritic, intensely silicified wall rock haloes in close proximity to the veins. The following figures outline the geology and geophysical characteristics that have been determined for the heart of the Barkerville Camp.